In the past five years, sound healing has gone from fringe new-age modality to a popular form of meditation, known ubiquitously as the “sound bath,” and featuring instruments such as Himalayan and crystal singing bowls, tuning forks, gong, drum, chimes, and other drone-producing instruments. 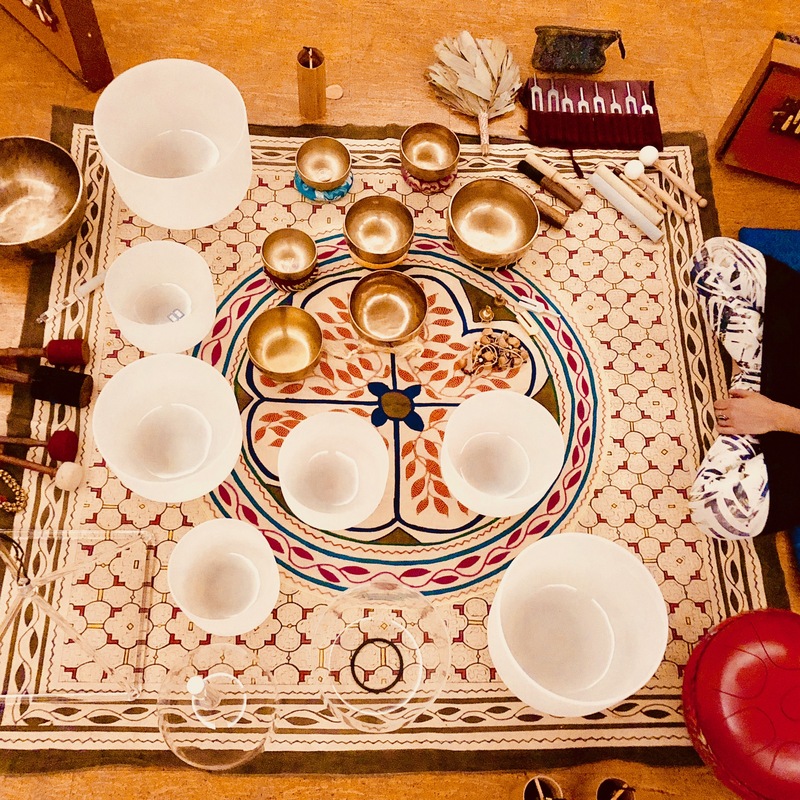 In the first session of this series, we’ll examine the anatomy of the sound bath, why sound therapy has garnered so much recent attention, and how sound is used as a tool for rest, mindfulness and transformation. One of the foundations of working with sound therapeutically is the practice of deep listening. By slowing down and engaging the entire listening body, we enter into sound in a way that can bring us to higher states of consciousness. Combining deep listening with the use of drone instruments, we create the potential for relaxation, where healing and reset of our nervous system can occur. How does sound “heal”? Can sound effect change in our bodies, minds and emotions, and if so, how? How can we harness sound to create more ease and wellbeing in our daily lives? In this three-part Roundtable series, we will explore the therapeutics of sound, as well as its background, history, and application in the healing arts, music therapy, and daily life, and as a fast growing field unto itself. Through the lens of deep listening, we will experience sound’s inherent potency firsthand and learn how to refine our own personal sonic landscape to create a more peaceful existence. Jessica Caplan is a certified sound practitioner, vocalist and yoga teacher. A graduate of the Open Center’s Sound and Music Institute, she has created sound experiences, retreats and trainings that weave her passions for music as medicine, and the power of community and self-connection, since 2013. Jessica teaches sound immersions and retreats at Maha Rose Center for Healing, and is on the faculty of Prema Yoga Institute, a training school for yoga teachers, where she regularly co-teaches Sound Yoga Therapy Immersion. In addition to yoga studios, festivals and event spaces, Jessica has also brought her sound work to youth at schools (Montessori School), graduate students (CUNY Graduate Center), and caregivers and chaplins (St. Mary’s Care Center, Madison, WI), to name a few. Jessica is a Reiki practitioner, and also teaches a holistic, intuitive approach to opening the singing/sounding voice, both privately and in groups. She continues her studies of yoga, sound healing, Native traditions, shamanic practices, and classical Indian music. Jessica is also the co-creatrix of SoundMind, an audio meditation series combining meditation with therapeutic sound, released in the fall of 2016. Katie Down, (LCAT, MT-BC, MM) is a licensed creative arts therapist, music psychotherapist, Reiki practitioner, deep listening practitioner, teacher, composer and performer. She has been facilitating sound bath meditations and deep listening workshops for over 10 years offering classes, and training programs in music therapy and sound meditation/healing as well as clinical supervision for LCATs, LCSWs, MDs and other creative arts therapists. Katie received her master’s degree in Music Psychotherapy at New York University with additional trauma training at the Institute for Contemporary Psychotherapy and with Laurel Parnell in EMDR and Mindfulness Based Stress Reduction with Paulett Graf. Incorporating MBSR, EMDR, sound and creative visualization for trauma and trauma-related symptoms, Katie provides a nurturing, grounded and open environment for opening the heart and letting go of blockages and negative patterns that hold us back from feeling connected to our higher selves and each other. Katie is the Department Chair of Music Therapy at the Brooklyn Music School, meditation teacher at MNDFL, and practitioner at Maha Rose Center for Healing, MINKA Brooklyn, and the Bhakti Center. She co-directs the Maha Rose Sound School with Jessica Caplan and the SoundBody sound training program with osteopath/sound practitioner, Joseph Schmidlin and gong master, Michael Jay. Katie has designed and taught the courses “Music and Mindfulness in Clinical Applications” for The Spiegel Academy, “The Art of Listening” at NYU, and The School of Visual Arts, “Deep Listening and The Musical Drone at Cal State Fullerton, “Sound and Mindfulness in Contemplative Care” at the Art of Healing conference at The Jewish Theological Seminary, The Expressive Arts Therapy Summit, and The International Conference on Deep Listening, and has presented her music therapy work at grand rounds presentations for local NY hospitals. Katie has worked internationally in the Balkans, South Africa, and Ecuador, offering workshops and events in improvisation and song writing and has trained with Musicians Without Borders in the Netherlands.